The Catholic Encyclopedia was completed under Benedict XV, who relaxed the suppression of modernism and disbanded the Sodalitium Pianum, as is commonly known. He was also the first to say the experimental dialogue Mass, and consequently, it is not surprising to find the Encyclopedia endorsing congregational singing. Hence, the quote which you supply more or less acknowledges our contention, then shows the post-Pian author overturning Pius X's norms with a novel interpretation then in favor with BVX (and the popes which followed). The proof of this reading of things is that you will not find females in choir (unless we are speaking of conventual Masses in which case special laws govern) before Pius X in the entire history of the Church, unless you go all the way back almost to apostolic times (archaeologism). And more than this, not only did the same article you quoted from note a negative ruling in 1908 on the subject, but the newspaper article I quoted previous to you CE post clearly shows the American hierarchy as understanding Pius X affirmed the ban on women in the choir, and they were rebelling against it. "St. Pius X had forbidden women to sing in scholas in his 1903 encyclical but Fr. Anthony Ruff's new book Sacred Music and Liturgical Reformdemonstrates two very important points with regard to this prohibition. 1) The prohibition against women singers was completely ignored all over Europe and especially the United States. The encyclical itself had a huge impact on the Catholic world but for this narrow point. In fact, "indults" to depart from the letter of the law were being issued by the Pope personally just days after publication [because of massive revolt], and ever more leniency was in effect within a few years at the hands of legislative bodies overseeing the liturgy. It was nowhere enforced [because of massive revolt], and one can tell that just by looking at pictures of chant classes conducted by Justine Ward [feminist/modernist mentioned who had the ear of Pius XI, mentioned by Dr. Byrne] in the United States: more than half the students were girls and women. Indeed, women were at the forefront of the movement. The tradition of women singing at Mass has always been integral to life in a convent, and there are extensive records of women singing polyphony in England. As for the Vatican itself, its practice of using only men and boys to sing reflected a long-standing tradition and not so much an adherence to doctrinal norms. Later, as is well known, Pius XII legislated in favor of permitting women to sing, legislation which didn't change the practice much either since the original edict had not had much effect in any case [because of massive revolt]. 2) Fr. Ruff further demonstrates that the edict of Pius X had nothing to do with discrimination but rather stemmed from a widely held position of the Cecilian movement that the choir performed a clerical roll in the liturgy and hence it should share as closely as possible in the features of the clergy. The Cecilians believed that the singers should be men because the priesthood was limited to men; they further hoped that the vocation of schola member would be lifelong and that singers would, for example, under the ideal, receive tonsures. " This discussion makes me wonder how many Catholics no longer see themselves as subjects to the Pope, but rather see the Church as a democracy with lay veto power over the laws and teachings of the Popes, in this case Pius XI and Pius XII. That’s a rather ironic statement, coming from one who vetos the papacies of the last 6 pope’s! Distracted with so many occupations, it is easy to forget the things that lead to perfection in priestly life; it is easy [for the priest] to delude himself and to believe that, by busying himself with the salvation of the souls of others, he consequently works for his own sanctification. Alas, let not this delusion lead you to error, because nemo dat quod nemo habet [no one gives what he does not have]; and, in order to sanctify others, it is necessary not to neglect any of the ways proposed for the sanctification of our own selves. The fact that St. Pius X’s teachings does not/cannot apply to Paul VI, JP2, Benedict XVI, and Francis is a red flag. St. Pius X did not qualify his teaching, meaning it applies to all Popes. The fact that it cannot apply to these so called Popes, should show us that we need to take a closer look at whether they were/are Popes at all. If we cannot dissent to Frankie in Rome, then logically we lose our Faith. There is only one way out of this logical trap, to take out the of the syllogism that Frank is Pope, then it makes sense again and St. Pius X’s teaching remains perfectly intact and applicable. Would anyone dare to say that St. Pope Pius X taught error to the Church on this point? Another interesting thing is that the church's domain - SSPXFlorida.com is hosted by GoDaddy.Com. Go Daddy was known years ago for their sexually suggestive ads. Certainly there aren't Catholic options for hosting? Did the clown conductor lead the laity again yesterday, Sunday January 13, 2019? Is this nonsense continuing in the Florida chapel? 1) Which “dialogue” Mass are they saying? Last I heard, before the “dialogue” Mass became the Novus Ordo, there were at least seven different approved variations of yapping available (just like the No us Ordo)? 2) If there is dialogue between the priest and people, isn’t the Mass taking on an excessively horizontal aspect (a conversation between men rather than a sacrifice offered by priest to God), just like the Novus Ordo? 3) Is this trend toward the Novus Ordo the reason SSPX priests now say even low Masses in a loud voice (ie., they want to converse with the people)? 4) Why is the SSPX publishing books like “Liturgical Revolution” which show the subversive and novel origins of the “talking” Mass, but still implementing it in its seminaries and schools? More than all that, the dialogue Mass inappropriately emphasizes the educatory aspect of the Mass, rather than its primary sacrificial and propitiatory aspects (the main reason Latin gave way to the vernacular). But through the antiliturgical reform, reads have been inculcated with the idea that we “participate in the Mass,” as though those who had no liturgical role (like making the responses) were somehow deficient. To fight that trend, I no longer even use Lambert Beauduin’s invention of following along in a hand missal, but instead follow along with what’s happening at the altar and/or saying my Rosary. I find I don’t feel like I missed the whole Mass anymore because my nose was buried in a missal. Essentially, I am committed to rejecting the liturgical reform insofar as I can an an individual layman. 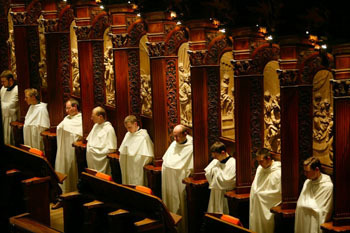 1. the "Dialogue Mass", a low Mass where the people speak the responses out loud normally said by servers. This is considered normal and unremarkable among European traditional Catholics, but has never caught on in the English speaking world. Trying to impose this practice on English speakers in the U.S. or U.K. where it has never been a tradition would be a bad idea for all sorts of reasons. 2. the practice of people singing the responses and all or part of the Ordinary (Kyrie, Gloria, Sanctus, Agnus) at a Missa Cantata. This is a traditional practice that pre-dates the "Dialogue Mass." It was common in the Middle Ages, started to decline around the end of the Middle Ages with the introduction of polyphony (but never entirely disappeared) and started to be reintroduced in many places in the 18th and 19th centuries, and especially in the 20th century following the 1903 Motu Proprio of St. Pius X, who commanded that "Special efforts are to be made to restore the use of the Gregorian Chant by the people, so that the faithful may again take a more active part in the ecclesiastical offices, as was the case in ancient times." Unlike the "Dialogue Mass," congregational singing of the Ordinary is widespread not only among European traditional Catholics, but also among English speakers, although it is not universal. There is a Hollywood movie from 1952 called "When in Rome." An American priest on pilgrimage to Rome has his cassock and saturno (and his money) stolen by a con man, who replaces them with his own clothes. Having nothing else to where, the priest dons the con man's clothes and goes to find the police to report the robbery. They instead suspect that he is the con man and arrest him. He protests that he's a priest. The Italian police officers ask him to prove it by chanting the Preface to the Mass: "only a priest would know how to do that." The priest obliges and the astonished police officers remove their hats as he sings "per omnia saecula saeculorum..." When he gets to "Dominus Vobiscum" and "Sursum Corda" all of the police officers respond to him by singing the responses perfectly. This scene makes absolutely no sense if it were not perfectly normal for Catholics to sing the responses at sung Mass in 1952; so normal that a police officer could sing "Sursum corda" as naturally as he could make the sign of the cross. As far as having a layman stand in front of the altar rail and try to conduct the congregation as though they were a choir; this does look very silly and completely distracting, and reminiscent of Novus Order "cantors" waving their arms at the congregation. It's unnecessary and a bad idea, even if it is normal in Europe - you can see the practice in of the SSPX pilgrimage to Lourdes in 2014 (at around the 11 minute mark). Better to use the organ as cue to the congregation of when they may sing. 1) That the Europeans consider the dialogue Mass "normal" is because the proto-liturgical reformers were European (particularly among the low countries). They successfully connived, plotter, manipulated, and conspired (as anyone who has read the memoirs of Dom Lambert Beauduin will acknowledge) to prey upon weak and liberal bishops. First obtaining permissions to hold congresses in their dioceses, usually in a monastery to keep things quiet. Then once a plan was formulated, they would seek permission for experimentation. Then the would fabricate reports about how well received the experiments were by the people, and the alleged good fruits obtained thereby. This would cause the weal and liberal bishops to grant further concessions, and their colleagues seeing their brother bishops grant such concessions granted their own, and so the movement -illicit and illegitimate in origin- grew and spread, until finally you had popes saying dialogue Mass. But it was always based on lies and deception, and contains fully the principles of the Novus Ordo. English-speaking readers can read the SSPX's own "Liturgical Revolution" by Fr. Diddier Bonneterre for starters. But let's not pretend the dialogue Mass was "traditional" simply because it was pre-conciliar modernism. The mutilated 1956 Holy Week of Pius XII (which gained support by the same illicit means of experimentation) was also pre-conciliar, but had only a 13 year history in the Church (with Palm Sunday and the sacred Triduum being almost completely remade into new rites). 2) As for the Missa Cantata, it was to be permitted by exception only, where additional clergy were not present to fulfill the roles of deacon and subdeacon. Why it is celebrated in some places having priests or ordained clerics to perform these offices is inexplicable. In the context of this two-tier system, it is of the greatest significance that the choir was traditionally considered a class apart from the congregation because its function of singing the liturgical texts belongs to the Bishops and the clergy. In other words, the choir is essentially a clerical entity. The ordinary faithful were, therefore, by definition not included among the singers performing liturgical functions. So, there are no grounds for believing that Pius X had a congregational rendition in mind when he issued his motu proprio on Sacred Music in 1903. Even before he became Pope, when he was Bishop of Mantua and Patriarch of Venice, the future Pius X issued documents on Sacred Music. (4) It is interesting that while they are all practically identical in wording and content to the 1903 Latin motu proprio, none of them mentioned “active” participation of the laity – or even broached the subject of congregational singing. "